Client Spotlight: Tradin Organic at NPEW 2017 | Absolute Exhibits, Inc. The 37th annual Natural Products Expo West & Engredea, also known simply as NPEW, is the world’s largest trade show for natural, organic and healthy lifestyle products. This year’s show was held on March 9-13 at the Anaheim Convention Center and drew in a record-breaking crowd of over 80,000 attendees and 3,100 exhibitors, including 500 first-time exhibitors. Among those exhibiting was our client, Tradin Organic, which is no stranger to NPEW and has worked with our team in the past. Founded in 2010, Tradin Organic is focused on the global sourcing and trading of over 180 organic and certified premium ingredients for the international food industry. 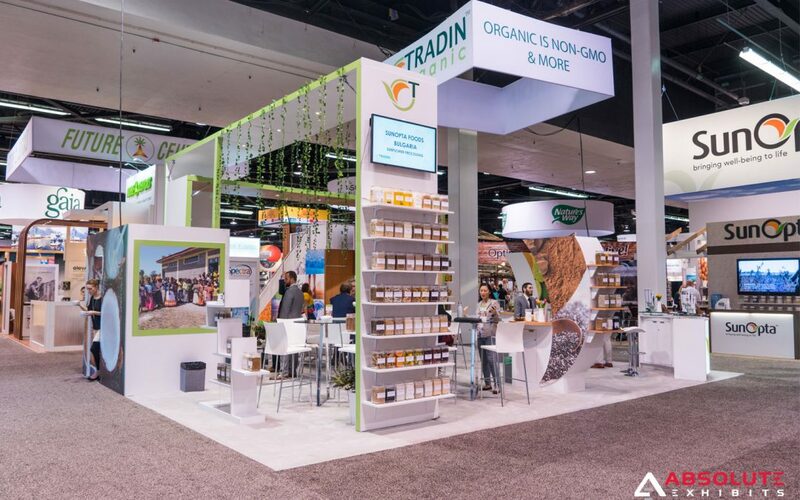 For this year’s show, Tradin Organic required an entirely new exhibit to accommodate a larger 24×30 island booth space as compared to previous years. Scaling down to fit a smaller booth space is often difficult, but – surprisingly – scaling up can also pose a similar challenge. With more space comes more responsibility to make the space functional, safe and beautiful, while also incorporating Tradin Organic’s show objectives. Tradin Organic wanted the booth to convey an overall ‘natural’ look and feel given the holistic nature of its organic products and feature large bridges to fill the newfound booth space. It was also important to Tradin Organic that the exhibit contain plenty of shelving to display its products. Our team constructed two (2) overlapping bridges, each measuring 13-feet and 12-feet tall, using an R8 Plus aluminum alloy system and added recessed lighting. The large, overhanging bridges helped make the space feel complete without actually filling the space below and taking away from the openness of the booth. Also overhead was a motorized 120×42-inch square hanging sign with dye sublimation printed exterior. We incorporated wood laminate, printed wood textures and greenery, including vines hanging from the bridges, which were a perfect complement to Tradin Organic’ organic products. The exhibit also featured an open seating area, semi-private meeting area, storage room and ample shelving on walls, kiosk workstations and free-standing, custom product displays. The finished product was a marvelous, nature-themed exhibit that stood tall and felt open and welcoming to booth visitors. We have used Absolute Exhibits for 1 year and going on our second. Absolute Exhibits was easy to work with and their team was dedicated to help make our budget, feedback, and timeline work, which we really appreciated. They are available to help onsite during set up and breakdown as well as during show hours. I appreciate their attention to detail and on our account and bringing our trade show vision to life!